Wow, for an inexpensive projector, this thing has lasted! Such high def, the only downside is brightness, but if you can manage to find a dark enough room, it's not a problem. With a compact size and lightweight body, this Pyle PRJG88 is a versatile digital multimedia projector that lets you create a large screen display, up to 80 inches, on any flat surface or wall. Connect the projector directly to your home theater system with a compatible TV, laptop, gaming console, DVD player or home computer. Playback all of your favorite image, video and audio media files directly by inserting a USB flash drive. Connectivity interface includes HDMI, A/V and RGB (VGA) connector jacks. Additional system features include picture adjustment customization options, top panel button control center, built-in stereo speaker, manual focus lens, user-friendly control interface and more. The projector is perfect for the home, office or classroom. 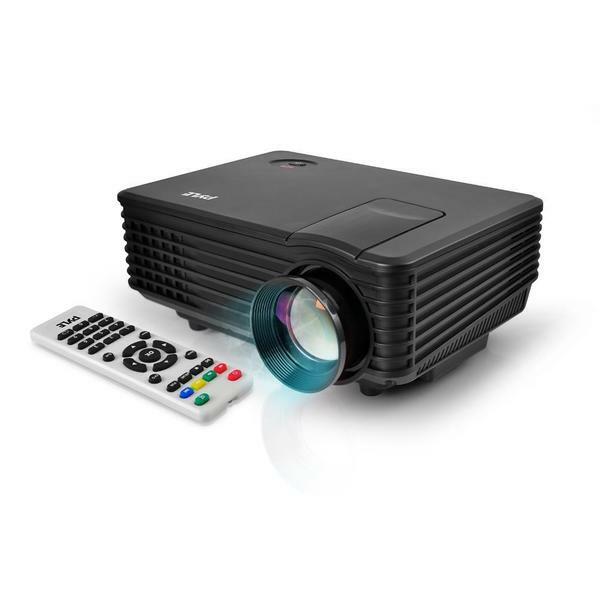 The Pyle PRJG88 allows you to enjoy versatile multimedia entertainment projection in a compact and portable style. This projector is great especially for the price. Nice and compact size. Easy to set up. Great picture so far. Purchased for outdoor family movie night. We have not had the chance to use outdoors yet but so far from just turning it on and testing it indoors, it has worked as expected. We have connected an external hard drive for movie selection with no issues. The sound is not great but plans to purchase a wireless speaker before using outdoors should solve this issue. The picture so far seems nice. Item was delivered as promised. So far recommended. I bought this as a gift for my husband. Don't waste your money on the movies anymore. Get you a dvd player buy some dvds hook it up to the projector and don't forget the popcorn. Have a relaxing night at home. Just like a movie theater without all the noise and people blocking your view. Wanted a projector to use for Halloween, this one is great for the dollar, works great. Clear picture, only wish the speaker was louder. Very light weight and compact for easy storage. I ordered this to have movie night outside. The kids and even the neighbors enjoy movie night now. Just point it at the house and bring out the popcorn. We use a wireless speaker bc the volume isn't very loud on it. But that's how most are. I was really excited to receive this item but the title was a little misleading. Is not 1080p but rather 1080p support which is totally different. Unfortunately we had to return this item because we were looking for something that was 1080p. Smaller projector with a punch. It has worked well for my art projects and was surpized to see the picture quality for movies was pretty decent also. Very impressed with the quality of the picture this inexpensive little projector provides!! Great deal for the price! We use this projector everywhere, inside and outside. Super happy about this purchase!! Grandkids think it's like the movies. You will need a need a speaker. I didnt realize this was not HD til i got it. It still has a pretty good picture but its not what i wanted. This projector was just perfect for a birthday party I planned!! And the price was just right! grandkids are enjoying watching movies outside with this projector. the picture is pretty decent. You cant beat the price! My husband setup the projector on the side of the house and we hosted a movie night. We connected to our ipad and launched netflix. This thing is a blast. We hook it up outside on our deck. Very easy to use. Fast delivery! "Does this projector have blue tooth capability??" "Can it be used for Netflix on your iPhone or iPad?" "Can I use it with Power Point and does the remote forward the PP slides?" "can a AMAZON FIRESTICK be used on this?" "Can this be used for PowerPoint presentations?" "Can I connect a speaker to it for a louder sound?" Yes you can I connect a beat box to mine and I works great. "How many lumens for this model?"